Part negotiator, part astrogator, and savvy in the ways of the galaxy beyond the Core Worlds, the Fringer is a jack-of-all-trades. He's got the gift of the gab when it's time to talk, and the awareness and reflexes to manoeuvre away when it's time to run. 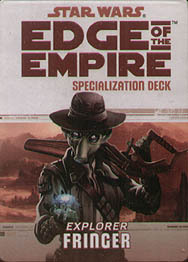 This deck requires the Edge of the Empire Core Rulebook and includes cards for all 20 talents available in the Fringer specialization.